April 29, 2007 Colette's Drawing . What I'm doing now is introducing you to Colette's art work. It's not easy. In the photo above, starting in the upper left corner, there are five things to talk about. Topic 1. The framed picture. This is what it's all about, what Colette calls a "drawing," a work on paper using various drawing media like oil crayon and pastel, often quite intense. The idea of abstract art comes from the late 19th century. It used to be controversial. Now it is common, but that doesn't mean you are necessarily comfortable with it. Colette likes to think of her drawings as "Midwestern landscape." As time goes on, there will be more thoughts about this on our site. Lots more. Topic 2. To the right of the picture: a place where plaster has fallen off the wall. I am not a house person. It's hard for me to think of fixing up every single thing in this old house that needs fixing. So, I prefer not to think of this topic at all. Colette and I are not together on this. Topic 3. On the south wall, the left edge of a large drawing. Colette works in her third floor studio Monday to Saturday, 7 to noon. Most of the time she is working on two things: a large drawing and a thread piece. Large drawings take a week to finish. A thread piece may take three months. There are smaller drawings, like the one in the picture. These are like studies or sketches. As soon as I figure out just the right thing to say, you'll see a large drawing here. Topic 4. 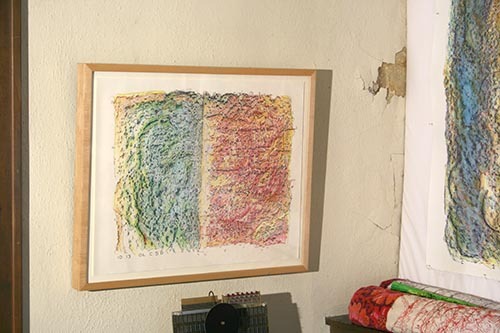 Below the large drawing, a rolled up thread piece. More than wars, more than the movement of peoples, more than people vanishing from the face of the earth, the most important aspect of the 20th century was the process of finding the answer to this question: "What is art?" Correct answer: "Anything at all, but there sure is a lot of bad art." I don't think there were quilts on the walls of major museums in 1850, but by 1950 there are. As a general, high-toned phrase, "fibre art" grew to encompass many kinds of objects. Colette likes to imagine herself stepping aside from the flow of the modern tradition, so she calls what she does "thread pieces." Topic 5. Below the framed drawing, a circuit board from an ancient computer used to create our algorithmic drawings. It cost more than a million dollars and was much less powerful than the laptop I am writing this on. Ain' t progress grand! 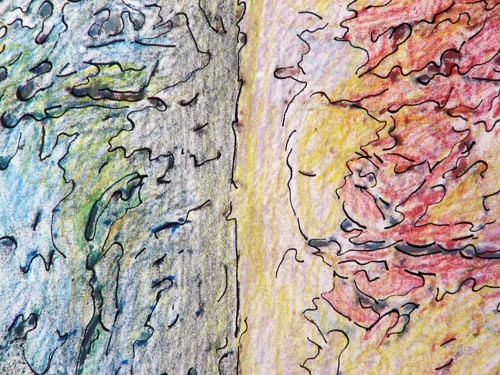 Ultimately, you look closely at Colette's drawing and there are wonders: color, line, form. You step back and realize that every square inch of every drawing has wonders. You may think this is a little too much, but life and art are only so long, so make the best of them.